Leonardo designed many machines to harness the forces of nature for human convenience. Most were simple mechanisms, such as pulleys and levers that could be applied in a variety of contexts. But others were far more complicated. Barrel springs were used as a source of power for clocks but their power gradually diminished as they unwound. The ideal solution was a single mechanism capable of regulating the power of the spring to achieve the delivery of even power as the spring unwinds. 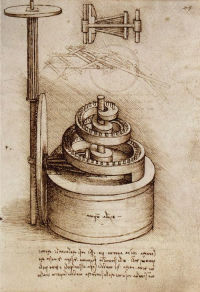 In Leonardo’s design, as the spring contained within the cylindrical barrel unwinds, it turns the central axis and the pinion climbs the toothed spiral. The vertical motion of the pinion on its revolving axis on the left will be controlled by the sliding gear, which is illustrated separately in a separate drawing above. This drawing is one of several similar sheets that may have been intended as part of a treatise on the “Elements of Machines”. The approach and technique of the drawing recalls the artist’s anatomical studies. The aim was to achieve a solution where all of the elements worked in perfect harmony, not unlike the human body. Do not forget that the books on the elements of machines with its beneficial functions should precede proofs relating to the motion and power of man and other animals; then on their basis, you will be able to verify your propositions. The Codex Madrid I was rediscovered in 1966 together with the Codex Madrid II. This is a bound volume with precise, carefully worked drawings concerning mainly the science of mechanisms. Priority is given to the drawings, which are accompanied by a commentary or a caption. The care taken with the layout of each individual page and the finesse of the drawings indicates that the drawings are close to publishable form, either as a presentation manuscript or printed treatise.